If you own a Pomeranian puppy or dog, it’s essential that you buy the right bowls. So let’s look first at the differences between stainless steel bowls and plastic bowls and learn why this is such an important decision. • The ability to feed your dog the right portions of food. • How well he drinks and eats. • His feelings of security and comfort. • The prevention of algae, mould and bacteria in his drinking water. • How fast he eats (can cause trouble if he eats too fast.) If you want the ideal dog bowls, you can’t go past stainless steel because it’s a superior material to keep your dog healthy. Ceramic and glass bowls work well as doggie water bowls. They slide easily across the floor, especially if it’s tiled or some other smooth surface. This is partly due to being a lightweight material. A stainless steel bow is heavier so it’s harder to move, making it easier for your dog to comfortably enjoy his food and water. Plastic is soft and easy to scratch, as well as getting scratches and nicks. The miniscule crevices are places where bacteria thrives abundantly. You can’t just rinse a plastic bowl; instead, it needs a lot of hard scrubbing. This will seem like an endless cycle, to clean the bowl after each meal. Stainless steel is resistant to scratches and lasts longer. The surface is smooth and free of any scratches so bacteria and germs can’t get in. Your dog may lose the pigment of his nose. Approx. 35% of all dogs who eat from plastic bowls will have some degree of discolouration on their noses. The dyes may leak and there’s a chemical reaction that also have an effect on the colour of his nose. However, if you switch to a steel bowl, this problem can be reversed. Plastic won’t cool the water and keep it that way. Dogs prefer to drink cold water than liquid with very little temperature change compared to the rest of your home. Plastic hits room temperature much faster than stainless steel bowls. How well he drinks and eats. Your pet can’t reach the bottom of the bowl if it’s too deep. If it has a high rim, your dog can knock his forehead. If the bowl isn’t heavy enough to make it stay in place. This means he may not be able to access all the food in his bowl. Comfort. Dogs are at their happiest when they don’t have to worry while they’re eating. If the bowl gets pushed away all the time, it can make him become frustrated, vulnerable and stressed when it’s time for his food. Correct serving size. Owners commonly buy bowls that are too big. This means you may overfeed him because when you put the “right amount” into his bowl, you feel the urge to add more because the bowl is still half empty. Owners then fall into the trap of thinking their dog isn’t eating normally because food may get left if he’s too full to finish it all. Digestion. Dogs will eat food slow, medium or quickly. How much they can eat will vary according to the type of dog. 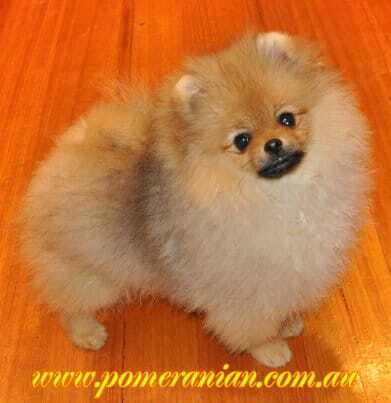 For example, a Pomeranian (a toy dog) won’t eat a lot and may be a slow eater or could empty the bowl in one minute. If your Pom eats too fast, you may use a portion placer or a slow-feeder bowl as both types allow the food to be displaced, slowing the eating speed of your dog. Cleanliness. Bacteria and germs can cause serious problems if you use plastic bowls. Stainless steel bowls still need to be cleaned but it’s much easier because of the durable surface. Raised level versus floor level. Both options can be used but there are variables. Your Pomeranian can be comfortable with either, depending on its specific issues so do your research and ask the vet which may be the best choice. If your puppy or dog loves being fed by hand, a raised bowl is the better option. If your Pom has problems with his neck (perhaps a collapsed trachea or a different issue), set the bowl at the ideal height for him. Preferences. It’s almost impossible to guarantee your Pom is drinking and eating enough, it’s a good idea to try different methods and see what works best. Ensure he loves both bowls, he’ll be keener to eat and drink from them, thus ensuring that he gets sufficient nutritional requirements and that he drinks plenty of water. Fountains versus a floor water bowl. If you can’t persuade your Pom to drink plenty of water, a dog water fountain may help. Filters keep the water clean. The flowing water gets his attention and he’ll generally stay there for a longer time. Let’s check out the ideal bowls for Pomeranians. Gpet Stainless Steel Paw Design Dog Bowl with Rubber Base, Set of 2, 32 Ounce GPET stainless steel Dog Bowl with a rubber base. (Set of 2).This type of bowl is amongst the best. They’re made of stainless steel, are resistant to rust and can be used in the microwave. The bottom has an anti-slip rubber that can’t damage your floor and your set of two also provides you with a 5 year guarantee. Premium Elevated Dog and Cat Pet Feeder, Double Bowl Raised Stand Comes with Extra Two Stainless Steel Bowls. Perfect for Small Dogs and Cats. This is a set of 4, raised double bowl and the bowl’s base is made from water-resistant bamboo. This set is perfect for small dogs with a height of 4 inches. That means you can use it for Adults but not puppies. If your Pom dislikes stooping, it’s the best one available. The bowls have a 100% satisfaction guarantee. Dogit Stainless Steel Double Dog Diner, Medium Dogit Stainless Steel Double Dog Diner. This is a great option for a few reasons. It has a mini size (8.4 fluid ounces) if your Pomeranian is 9 pounds or less. It also has a small size (13.5 fluid ounces for Poms that weigh 10+ pounds. This way you know you’re using bowls of the right size. It also has a stand to lift the bowl to the correct height for your Pom to feel comfortable when he eats. These bowls are simple to clean by hand or, considering that they’re dishwasher safe, put them in for an easy clean. Fossa 24 oz Double Bowl Small Stainless Steel Feeding Station for Puppy &amp; Small to Medium Dogs Or Cat Fossa No Spill Stainless Steel Dog Food Bowls. You’ll get a water and a food bowl as a set when you choose this option. It’s also ideal if you have two Poms and they love eating next to each other. The area around the bowls is made from food-grade silicone, designed to catch splashes and spills in the middle groove and the outer edges that are flipped. The bowls keep everything tidy and clean from a visual perspective and while your beloved pet eats his food. The bowls can hold 1.5 cups of food, an ideal size for Pomeranians. Why Do Pomeranians Spin In Circles?